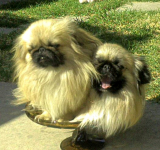 Great Pictures of some of our Pekingese Family Past from my 39 years of raising these wonderful little Furry Children. PASSED AWAY AND GREATLY MISSED, China Doll and Tinker Toy, Tiny Sleeves Full Grown on a Cake Plate! See China Doll in DOG FANCY Magazine April/May 2009. RETIRED Miss Milan, Mother to Butterfly and grandma to Many of our puppies past and present. Milan is a larger Toy who carries one of our very first Tiny Sleeve Bloodlines. Milan is retired to a Loving Retired couple and is being spoiled rotten with love. She gets her regular trips to the Groomer and is being treated like the little Queen that she is. RETIRED Wonderful Wayout Wookie and his tiny Sleeve sister Lilly. Rare Red and Blonde Livers. Wookie is a Tiny Toy, and Profusely coated when in full coat. He is the Proud Daddy to ANNIE. RETIRED White Sands of Dune, is a Tiny Toy, Silky coated, and carrier of the tiny Toy and Sleeve Bloodline. Grandpa to many pups. Marble Cake, Luigi's Beautiful Mom and she is the Grandmother and Great Grandmother to many of my pekes. LOU, Daddy to Dragon Master Luigi, and grandfather and great grandfather to many of my pekes. RETIRED Little Tanner, Small Toy and our tiny Sleeve China's daddy and Grandpa to many of our Pekes. REIRED My Sweet Bailette, mommy to Jambalaya, Dually and Shinobi White Mask verses the Black mask line. Bailette is Retired, and Jambalaya will hopefully have her very first litter this year. The younger years. All retired. But the family lives on with us in their offspring that we have and Love today. 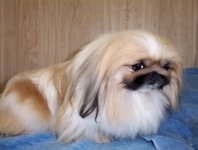 More of our Retired Pekingese Family over the Years. Their children, grandchildren, neices and/or nephews are still with us today.